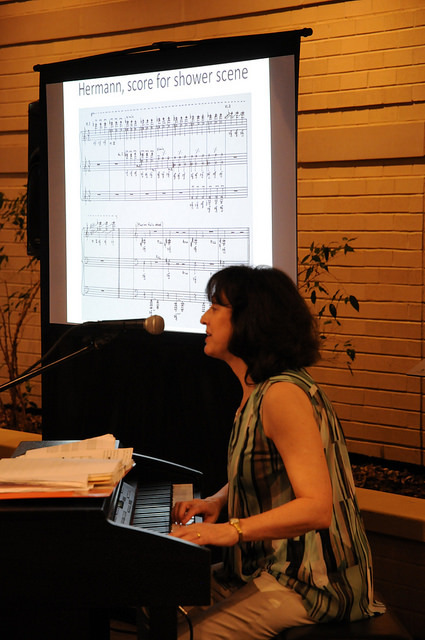 In 2014 Rachel created several lecture series on film music that have been a huge hit, leading to many requests to bring this fascinating subject to new audiences. 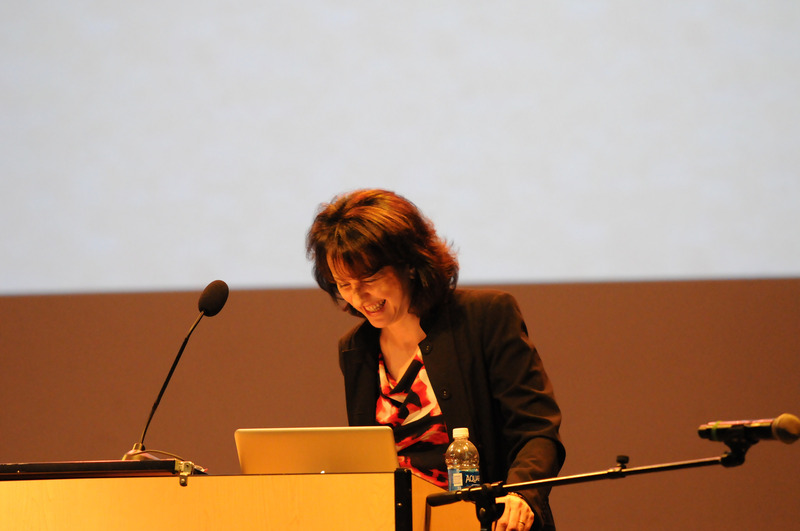 She has already presented multiple “Movie Music” lectures for the Academy Art Museum in Easton, the Annapolis Symphony Orchestra, and many other other venues. 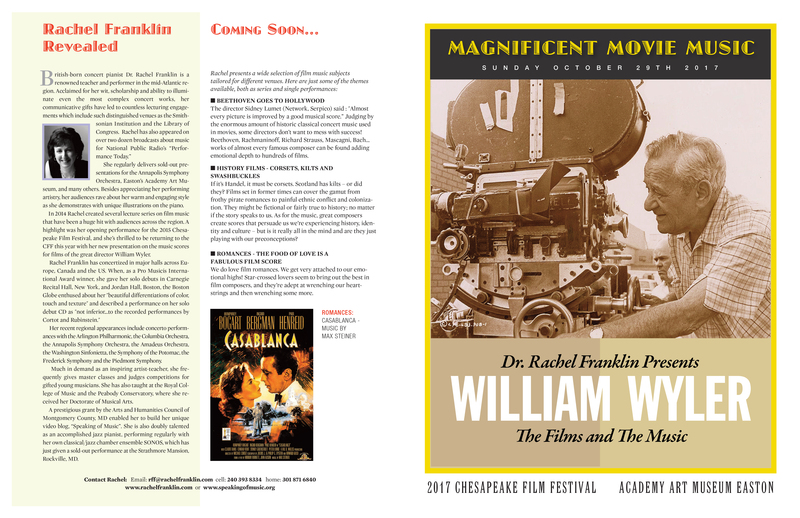 Highlights include her gala opening performance for the 2015 Chesapeake Film Festival and a return invitation to be their 2017 festival gala closing event. Magnificent Movie Music series for Spring 2019! 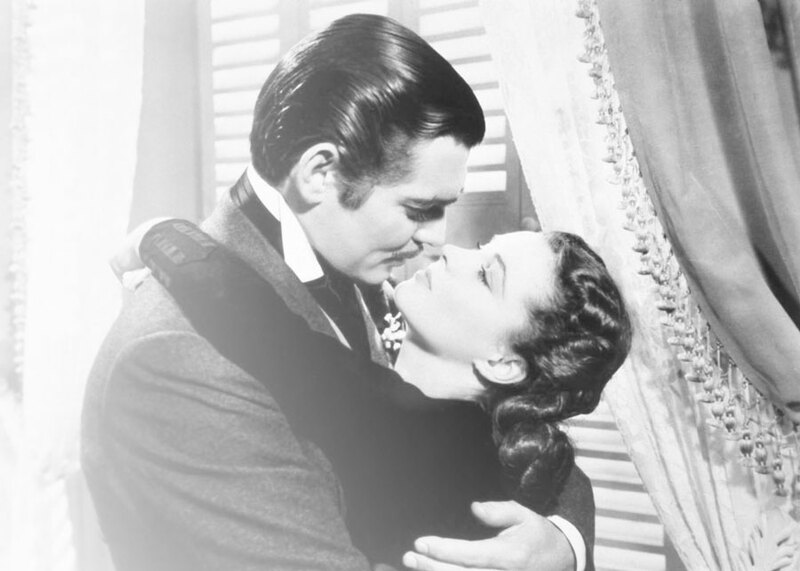 Film music can inspire and romance us. It can make emotional statements that a script can’t convey, it can subvert a plot with a completely different subtext, and inject irony, fear or humor when there is apparently none on screen. Music can salvage a bad movie and make a good one great. “Composers such as Bernard Herrmann, Max Steiner, Ennio Morricone and John Williams have engraved iconic scenes into our collective memory with their extraordinary music, even if the rest of the movie might have faded. What’s driving our limbic system and creating those indelible cultural memories? Experiencing superb movie music can have a life-long impact. Director Alan Parker stated “A great film score gets under your skin, triggers your subconscious, enhances the drama and helps drive the emotional power train of the movie.” With fascinating film clips, witty commentary and gorgeous piano demonstrations, concert pianist and movie fanatic Rachel Franklin delves into the hidden magic of some of the greatest film music ever composed. Enjoy spectacular jazz sounds from some of the world’s great movie scores, composed by some of the world’s greatest jazz musicians, including Duke Ellington, Quincy Jones, Chico Hamilton, Sonny Rollins and Miles Davis. Films range from noir and crime, to comedy and drama. 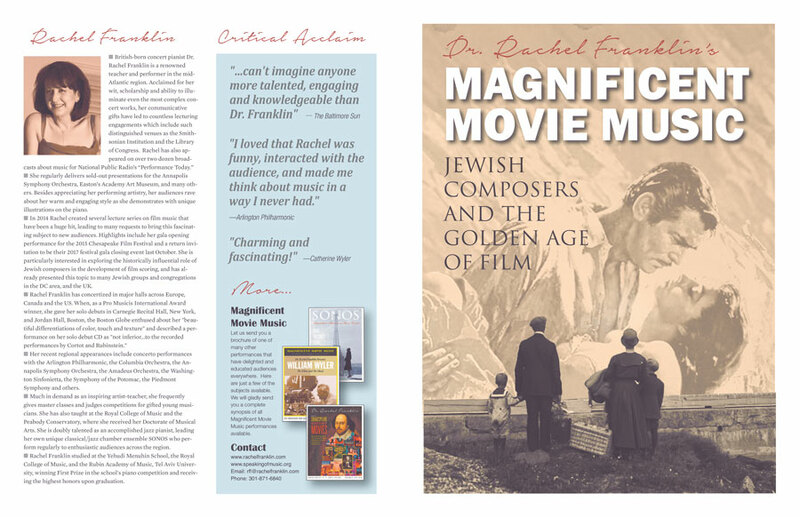 It is impossible to imagine many movies without the great Jewish composers of the 20th Century. Such figures as Max Steiner, Bernard Herrmann and Elmer Bernstein have engraved iconic scenes with their extraordinary music. 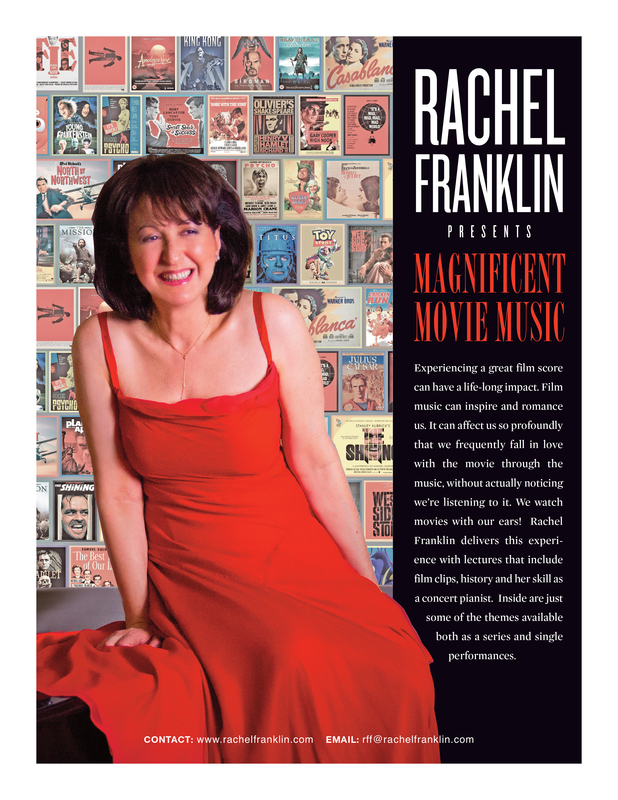 Travel through time with Dr. Rachel Franklin tracing the immigration patterns of Jewish musicians from Europe and Russia to Hollywood, and investigate how so many became such an integral part of cinematic history. “The Play’s the Thing” declared Hamlet, but nowadays he could easily have substituted “The Film.” Since 1900, this haunted Dane has starred in over 50 movies! 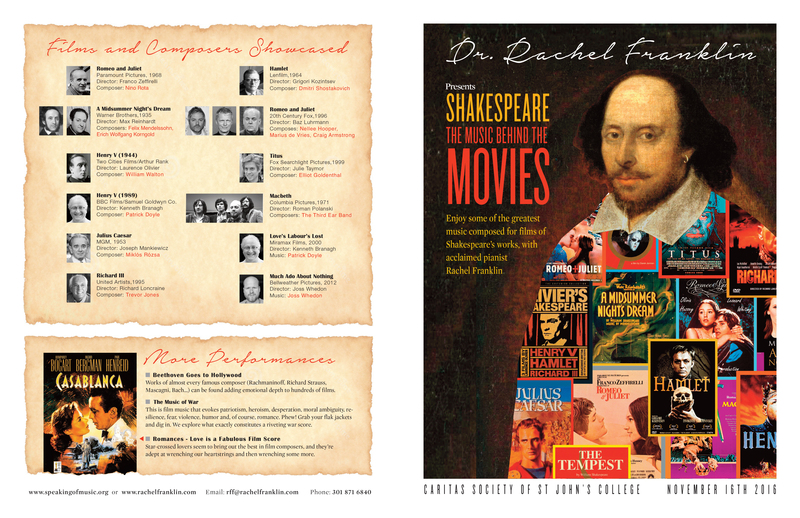 From Macbeth to Othello, Romeo and Juliet to A Midsummer Night’s Dream, virtually every play by the Bard has enjoyed multiple productions on celluloid. Master composers such as Nino Rota, Patrick Doyle and William Walton illuminate Shakespeare’s texts while helping us relate emotionally to his astonishing stories. Director-superstar William Wyler made some of the most magnificent films in the Hollywood canon, and worked with many distinguished composers. 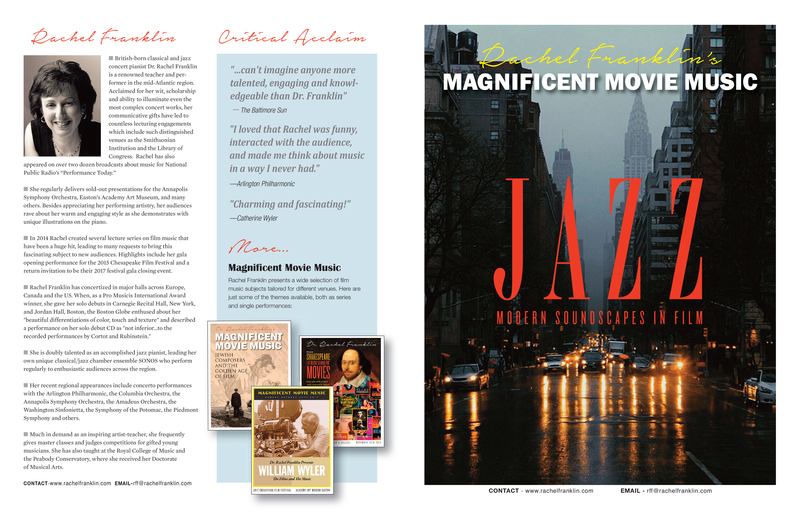 This dazzling array of musical talent includes Max Steiner, Miklos Rosza and Aaron Copland, and their movies range from Ben-Hur to The Best Years of our Lives.